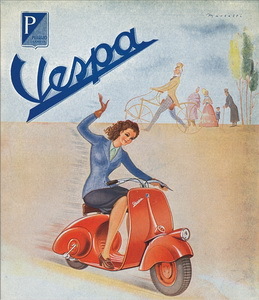 The first ever Vespa scooter off the Piaggio production line first appeared back in April 1946 and marked the beginning of a motoring revolution.That was the debut of the revolutionary little two-wheel vehicle, which, as well as leaving an indelible mark on the history of transport, became a real cultural phenomenon to successive generations. Simple and elegant, practical and comfortable, these are some of the characteristics that have ensured the popular scooter an unrepeatable success. This is the first Vespa that gives us the myth. Success is due to it's low price, and it's small consumption of fuel. Top speed of 75 km/h and cruising of 50 km/h. It was equiped with an external drive shaft between the rear wheel and the motor. The front fork uses a drag type wheel with the axle and shock absorber slightly aft of the fork. It is the same thing used on landing gears of many aircraft. This hand made Sterling Silver and Ivory White enamel vintage scooter - Vespa V98 from Arezzo Italy will enhance any vintage collection. The best way to find out how good these are vintage Vespas are, is to test drive one. Without exception, every one who has tried these scooters, have been amazed at just how good they are. We have a very large in house traffic free area, where you can have test drive all the cars. Please book in advance as appointments are necessary. all my passion...All that I see, all that I feel, all that I love.